There I was, in Nürburg (as in, the Nürburgring), walking through the night to get a beer or two at the Pistenklause, the town bar. There’s a BMW center there, and I stopped to look at the DTM car chilling in their lobby. Neat! Cool car. But, wait, what’s that in the parking lot? Oh. 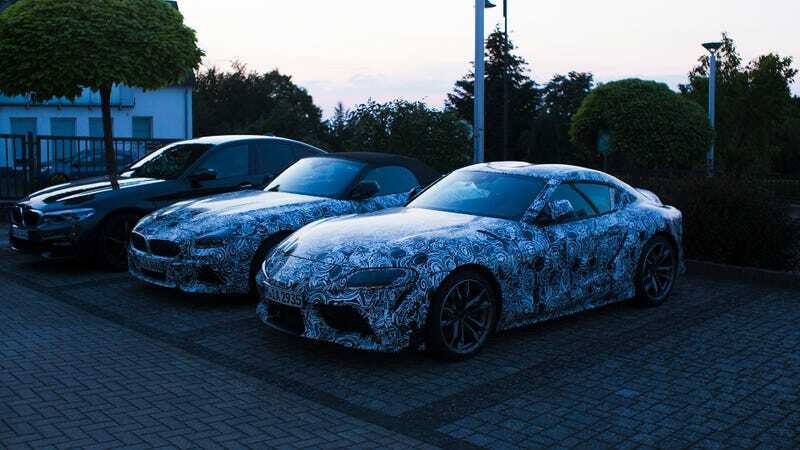 It’s the new Toyota Supra and BMW Z4 just hanging out. It took approximately 0.01 seconds for me to hop the little up-and-down gate that keeps anybody from driving into the place because, well, it’s not that often that one of the most hotly anticipated cars on the planet is parked right in front of you. During the day, the circuit will either be open to a private track day or to the Industry Pool, or i-pool. Carmakers only have to hand the Ring one million for access to the i-pool for the year and they get as much testing laps as they want. As such, it’s a pretty popular place for vehicle testing, and on any given i-pool day, you’re going to see something fun and interesting. Maybe there’ll be a Velar in full camo squealing all four tires. Maybe there’ll be a couple next-generation Porsche 911s howling by. Maybe there will be, for some reason, a Volkswagen crossover absolutely whipping. The point is, lots of testing happens here, so it’s not a big surprise to find prototypes running around, especially prototypes of upcoming German performance cars. hence the BMW Z4 and Toyota Supra, designed with a great deal of help and testing work from BMW. As has already been confirmed, we know that these cars will weigh about 3300-3500 pounds depending on how they’re spec’d. The Euro Z4 will be 3,384 lbs, for instance, the American one 3,527 as Automobile reports. That’s with the B58B30, 3.0-liter turbo straight six that you get in the M240i. We Americans will be getting that with 382 horsepower and 369 lb-ft of torque, up about 50 hp from the Europeans who have to deal with a particulate filter. I can’t say what either car is like to drive, but I can say that the Z4 looks super straightforward and not bad at all. Most of BMW’s recent work isn’t exactly to my taste, but this one is handsome. It’s what the E36 M3 convertible would look like in 2018, if it was heat-gunned and shrwinkled. The Supra, well, that’s the car I want to like, but it’s super strange up close. The rear spoiler, you can see particularly in contrast to the BMW, is really pokey and narrow. All the vents I could find were fake. Big bummer there, even if that’s just the way things are. The only other thing I couldn’t understand was this measuring device proclaiming “Deafen, you....!” or some play on words. “Tauben” can mean a couple different things. I saw the cars on track that same week. Tires screeching, the both of them, running lots of laps, and running hard. The only thing that was strange is that both were oddly quiet. That whole parking lot was quiet, too, these two prototypes sleeping for the night.